Error Code 1009 is an unwelcoming error message that iPhone users face amidst of downloading application from App Store. In another word, you are not able to download apps from App Store and your iPhone is showing error code 1009. iPhone users need not to worry as this is not something that can interfere with the functioning of your iPhone, it is just an error that can be easily fixed by following any of the solution shared in the article. Let’s know some of the ways on how you can fix this simple error and download your favorite apps from the App Store easily. First of all, you need to check if there is only one app that is not being able to get downloaded or the problem happens every application you can try to download. If the problem is with every application, then you need to use the other solutions given in the article. If only one application is showing error code 1009, then you need to contact the app developer to fix this error as this is not a software problem related to iTunes within your iPhone. This is a problem at developer's end, and only they can fix it for you. Sometimes App Store server is down, then there will be the error code 1009. 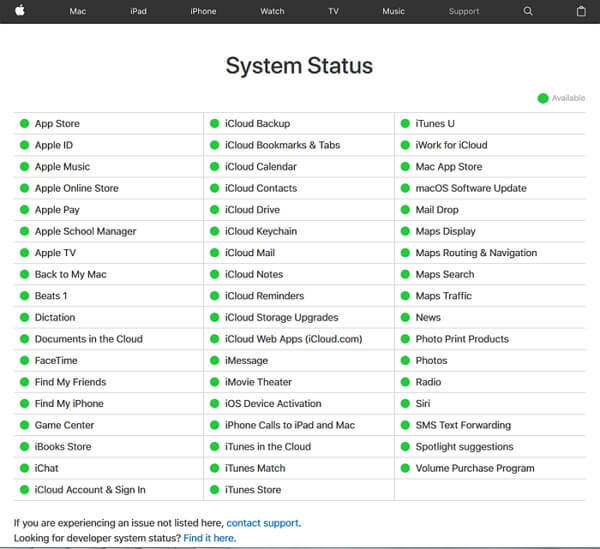 You can check if the server is down by visiting Apple system status page on their official website. If the App Store server is down for maintenance, you need to wait till it is up again and once it is up, you can try to download the app. Sometimes there are settings by the developer end that the application you wish to download is blocked in the particular country you are at the moment. To avoid the error 1009, you need to change the country on your iOS device. Follow these steps to change the country on your iPhone. • Open Setting app =>iTunes&App Store. Then click on your Apple ID. 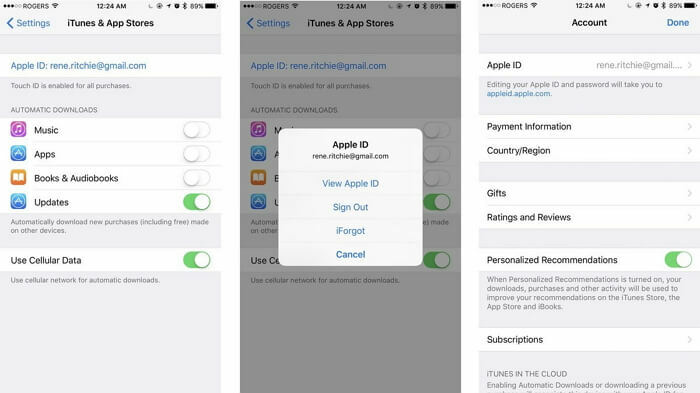 • Select View Apple ID on a pop-up menu that follows. • Enter your Apple ID and password. • On the Account screen, tap on Country/Region. Press on Change Country or Region and then select the desired country. • Then tap Agree at the bottom of the screen, and after that, again a pop-up menu will appear. • Now, hit agree and tap "Next" to finish the process. By this way you can change the country in your iPhone settings, and then you can try to download the application again, and hopefully, you will be able to do so and if not, do not worry we have other solutions for you as well. Make sure the time zone are correctly set on your phone. 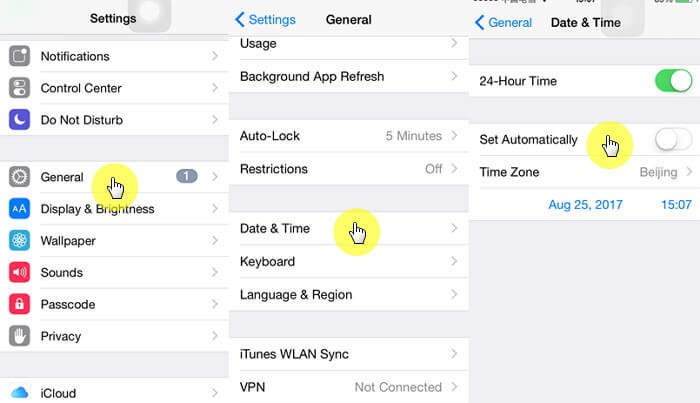 If the Time Zone is not set correctly on your iPhone, it can lead to error 1009. Make sure you set it properly everytime there is a change, for example, when you are traveling in another country. To set time-zone properly, Open Settings >> General >> Time. You can set it manually, simply turn off the "Set Automatically" feature and set it manually. • Open Settings from your iOS device home screen, and tap on Wi-Fi. 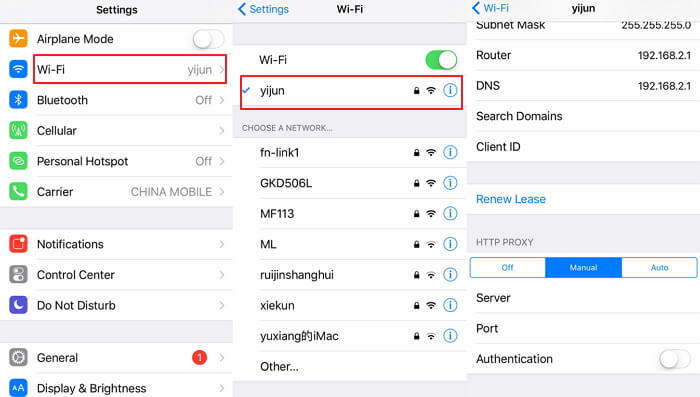 • Select the Wi-Fi network that you are using, and on the bottom of the screen, you will see HTTP Proxy settings. • Now, choose Manual to configure the settings manually. • Now hit Server and type the IP address, then tap "Port" as your provider shows it. 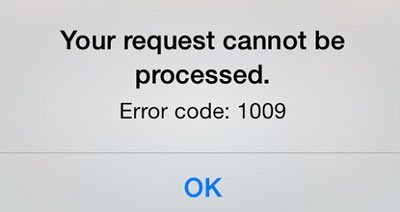 Now check if you resolved your problem of error code 1009 on app store. 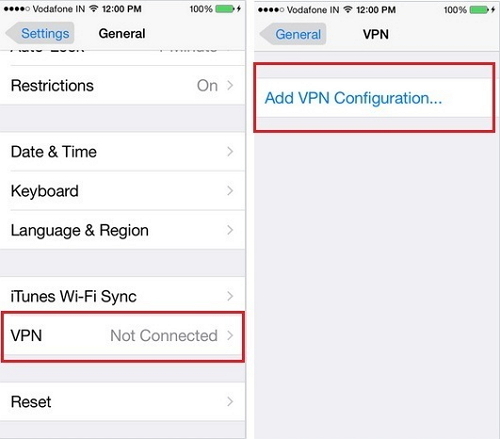 • Go to Settings >> General >> VPN. • Now, tap on "Add VPN Configuration." • Fill in the required boxes and check Off under the Proxy. The VPN service is now activated on your iPhone, and this is your solution for error code 1009. If in case, you tried all of these given solutions and still face the error code 1009, you can contact Apple or visit one of their physical stores. iPhone Error 1009 is a very common error that usually has nothing to do with the hardware of your iOS device. It is directly connected to software compatibility. The solutions shared above should work for you in getting the connection back to iTunes and apps should begin downloading, but in worst of the cases, Apple 's customer care or a visit to their physical store is your option too. Next time you see a message on the screen of your device, "Cannot process the request, error code 1009", you have so many solutions for this problem, all you need to do is to find out which one works for you. If you want to sync iTunes between iOS devices and computer or better manage your iPhone music, photos, apps and others, you can have a try of iMyFone TunesMate iPhone Transfer . It now works perfectly with all iOS versions including the latest iOS 11.3.